Prakash Raj has a daunting task ahead of him this week and he sure seems to be enjoying it. The actor is part of Preetham Gubbi’s next, Nannu Mathu Varalakshmi, in which he plays a motocross trainer, one who has been the biggest riders of his time. To get the ambience right for the scene in which Prakash trains a young rider, played by debutant Prithvi, the director has put together a set that is on par with authentic international tracks. “It is the sort you would see in the US or Mexico, where racing is really big. We will be canning shots in which Prakash will be seen taking a 20-feet-long jump on the grounds,” says Preetham. As for Prakash, he seems to be enjoying biking like never before. “Prakash has opted for a rugged salt-and-pepper look for this film. Incidentally, he loves bikes a lot too. We shot in Ooty for a couple of scenes recently and were required to move from one location to the other, which are around 40 kms away from each other. 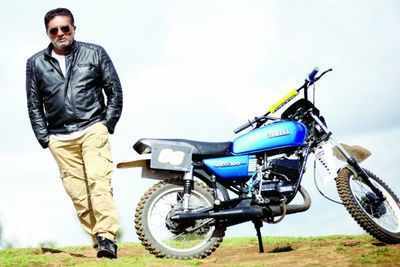 Prakash actually enjoyed his solo ride all the way there,” Preetham tells us. The team will begin shooting for these new stunts in Bengaluru today.